and only then, with context established, get into debates, proposals, commentaries, etc. Perhaps as subpages. The top level should read like an encyclopedia article. RobertJasiek: Do you have the slightest idea what inventing the Japanese 2003 Rules means? In 1993 I started the attempt to understand the Japanese 1989 Rules. Since 1997 I have made some more serious such attempts. Since 1996 I have been a go rules researcher. From the beginning of July 2003 to May 2004 I worked on the Japanese 2003 Rules as a full time hobby. In June 2004 I created the New Amateur-Japanese Rules. After centuries of doubtful usage, Japanese rules are explained finally. Surprisingly, while the model for professional-Japanese rules is about as complicated as expected, the model for amateur-Japanese rules is even applicable. The New Amateur-Japanese Rules are a very good explanation of post-1949 amateur-Japanese rules, should become the universal ruleset for Japanese style amateur rules, and in particular should be used by the EGF and the IGF. TJ: As I understand it, current Japanese rules are to play out any situation in dispute on a separate board, with the only thing that matters being the life and death of the group in question. In other words, the only valid ko threat would be one local to the group in question. If the stones die, and are not replaced with live ones, the group is dead, and removed from the original board, and scoring continues. With the dead bent four, this would mean that the killer starts the ko, and any ko threats remaining, removable or non-removable, are irrelevant, and the dead bent four will be "found" to be dead. In most cases, both sides know dead bent four, so the dispute phase can be skipped, there being no dispute if both sides agree it's dead. I don't understand how this is supposed to be difficult to understand, so I think I'm missing something here...could someone please tell me what I'm missing? The two black stones at the left are not dead. Black's compensation would take place in the center. "There are two ways of constructing a piece of software: One is to make it so simple that there are obviously no errors, and the other is to make it so complicated that there are no obvious errors." Bill: I do not believe that the last is possible under the current rules, and occurred only once before Japanese rules were codified. Matt Noonan: I've never heard of this before! Can somebody give a pointer to more information about "White wins, black doesn't lose?" BobMcGuigan One such game occurred in 1928, I think, in a ranking tournament game between Segoe and ? (I can't remember the other player's name). It involved a 10,000 year ko which didn't get resolved. The referee decided the outcome of the game was that White won but Black didn't lose. It's an historical oddity that was a factor in prompting the development of official rules. Charles Matthews See the ten-thousand year ko page for more about the Segoe-Takahashi game, and a link to John Fairbairn's article about it. Fwiffo: Under what circumstances do both players lose? Bill: Suppose that play was suspended with this position on the board, and White was ahead by 2.5 points on the rest of the board. If Black requests a resumption, White can make seki and win, while if White requests a resumption, Black can make 5 points of territory and win. Since neither player can win by resuming play, both lose. Rakshasa: Actually, it doesn't make the point clear. Under what circumstances would white not want to play for seki? If it is like it is now, then both players ended the game too early. Bill: Yes, they stopped play too early. That's what gives rise to this kind of problem that the Japanese '89 rules address. If play stopped too early and the players discover that but whoever requests a resumption would lose, the rule seems to say that both lose. However, the wording is obscure. Here is an example from the official commentary. Black can kill White with a play at a, or White can live with a play there. Since this is a huge swing, it probably affects who wins or loses. Say that it does. If White requests a resumption, Black kills, while if Black requests a resumption, White lives. However, if neither player requests a resumption, the White stones are dead, anyway. Why is that not the result if there is no resumption? Rakshasa: If both players ended it too early, then it isn't the ruleset that has problems. ;) Perhaps it should have a clause about who goes first if both want a resumptions... But should the rules add bloat to deal with situations that arise due to sloppiness from the players? Bill: Well, in a sense neither wants a resumption, since whoever requests one goes second. The Japanese rule may be fairer than, say, the AGA rule, in which resumptions just continue with the last player to move going second. The point is that such a situation is likely to arise only during discussion after play has stopped, so that the players have mutually discovered correct play (or play that both now believe to be correct). Better that neither player benefit rather than that one player benefit at random. As for the rules dealing with situations that arise because of player errors, they pretty well have to, don't they? Otherwise they assume perfection. Just like laws in real life, game rules have to deal with human imperfection. Interpretation of professional Japanese rules: The Japanese 2003 Rules are the authoritative interpretation. In addition to L and D, it'd be nice to touch on some of the other issues, ie. 3PWC, filling the last ko, famous disputes. 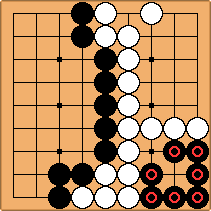 This position, under the new amateur japanese rules, would not score for any side. "authoritative interpretation"? Says who? Opinions please be tagged with author. That version which counts three points in a hane seki? HandOfHair: I respect the rules of Go in spirit. Nonetheless, I think it's important to watch out for people who go by the letter. For them, the Japanese rules introduce a pretty annoying loophole. Here, white wins by 1. However, black can find a loophole by obnoxiously arguing that the stones marked are not dead. If white lets black have his way, then black wins by 16. So instead, white plays it out while black passes. Now black wins by 1. LukeNine45: This is not the way disputes are resolved using Japanese rules. 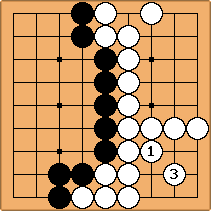 The plays 1 and 3 would be made only hypothetically to determine the status of the black stones; once the status is resolved the board is scored in the original position. This is the meaning of the line "Resolving disputes about life and death or protective plays depends upon hypothetical play with special ko rules" in the main page. NhanHo? : I have a question to ask. I've seen time and time again saying that hypothetical play is used to determine life and death issue, though the game is scored in the original position. However, reading the 1989 rule from the Japanese Rule page, I couldn't find any reference to such ruling, am I missing anything? A player does not have to remove opposing dead stones from his territory by occupying all their liberties as in Article 5. He can remove them as is, without making further moves."